Customer experiences are what determine customer satisfaction. In every company, the set of conditions defining the customer experience change according to the product or service exchanged.Recently, we listened to an interesting webinar on the Harvard Business Review website called "The Future of the Customer Experience." According to Luke Williams of Qualtrics, we live in an experience economy in which consumers drive things by their choices. They can easily switch from one brand to another, but this phenomenon is more likely if they have a bad customer experience. What's more, "The experience economy means that businesses have to orchestrate these memorable events for their customers, and that memory itself becomes the product. It becomes the experience." The experience economy has a direct relationship with a service delivery model built upon transactions between field technicians and customers. Field Service operations need to ensure that field technicians attend to customer needs. Consumer experience, so to speak, is not completely standardized in the field service delivery model. Today, your company owns a fleet of vehicles designed in the same way to reflect your current brand. Your employees arrive on the job wearing the same uniform regardless of their expertise and bring the same minimum qualifications and customer service training. Your company has enabled their success with end-to-end mobile functionality, but the consumer experience still boils down to the single transaction between an individual field technician and a customer. Depending on the personality of the technician and the mood of the customer, the experience could range from excellent to poor. The quality of the transaction depends on what a customer needs and the degree to which the particular field technician can meet his or her needs. With so many factors influencing each transaction, your field service operation must find ways to standardize and improve the consumer experience. We know that you're shaking your head at this point. After all, you've put so many training protocols in place and spent time with field technicians to ensure customers receive a minimum level of service. You handle the complaints, manage field technicians who fail to meet your company's standards, and train new technicians. It's an endless cycle of customer service and performance management. That being said, you must lead the team effectively, always ensuring that technicians create the positive service experience memory to which Williams referred. This remembered positive experience is something that customers will expect again and again. Customers with less than positive experiences not only remember them worse than perhaps they actually were, but they also spread the word to their social networks, impacting your brand. At the same time they leave the fold, switching brands at a higher rate by choosing your competitors, reducing your market share and future recurring revenue. Ensure positive experiences through ongoing training. Require field service technicians to show up on time, on schedule. Deliver automatic, digital feedback to customers based on schedule status and technician location on the day of service. Ensure field technicians have the knowledge, parts, information, tools and applications required to resolve customer issues in one visit. Require that employees provide each customer with a formal estimate and answer their questions before services are rendered. Offer instant onsite surveys to ensure customers are satisfied with the service delivered. Enable field technicians to do more for every customer, providing personalized service and product offers based on asset and service history. Reward employees who demonstrate consistent knowledge of their service area and the needs of their clientele, as well as those who excel at their jobs. Field service management software has come a long way from manual or rules based systems. AI-based scheduling and dispatching solutions maximize capacity using both employees and contractors, while providing both with the ability to personalize each customer experience through configurable mobile mobile tools. Today's best field service management solutions expand the functionality base to the entire field service-life cycle, from customer engagement to claims management and reporting. 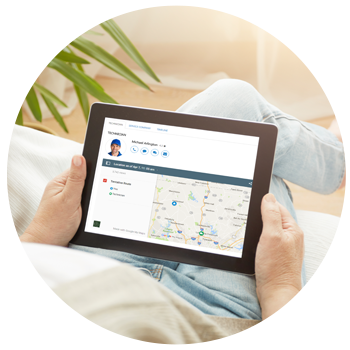 Artificial Intelligence based optimization, interactive Gantts and maps facilitate field service organizations' ability to improve the customer experience through better schedule adherence and status updates. Improved technician mobile enablement features give field technicians the tools they need to get in and out in one trip, reducing wait time and improving the overall operability of products. Integrated, digital customer engagement solutions including registration, diagnostics, self-scheduling and personalized point-of-sale offers put the customer experience in the hands of your customers, enabling them to interact with your technicians when, how and where they choose. As a field service organization, focus on how your field technicians and your technology can deliver a better total customer experience. Look for new ways to exceed customer expectations at each field visit. Create a consistent, and consistently good, brand experience for each customer. To learn more about how to provide a great customer experience, join ServicePower's webinar on November 9th or 13th!